Walker's Low Catmint is a perennial that has fragrant leaves and purple flowers on long stems which bloom through the summer into fall. The minty fresh fragrant leaves are a gray-green. It will grow to a height of 24" to 30" tall and up to 36" wide. Shear it back when the flowers slow and it will produce another flush of flower. 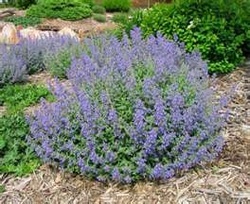 Walker's Low Catmint likes to be planted in full sun or partial sun. Use this plant as a backdrop in a perennial garden or in a container. Walker's Low Catmint attracts butterflies, bees, and hummingbirds. Cat's are also attracted to the smell of this plant. It is drought tolerant once it is established and it is also a Firewise plant. Walker's Low Catmint was also named 2007 Perennial Plant of the Year. It is very easy to grow.